Good morning Word Pressers. I find myself a little lost this morning. I keep seeing all your wonderful blogs rolling out posts day after day and everyone seems to be feverishly beavering away with interesting articles and news about their various wonderful writing projects. And then there’s me, thinking, what am I doing? It’s February, I just had my birthday, I’m 41… past the half way mark and I’m sure my life is going in reverse instead of forward full throttle. My head is all over the place, and my life is…well stuck! So I thought I would stop worrying about everything today and share a little kids book I have been messing around with. It’s for one of my little girl’s friends so that is why it has the rather weird and wonderful title “Poppy’s Close Encounter of the Purple Kind”. My first story with aliens in it LOL. As she joined the throng of curious onlookers, she tried to find out what all the fuss was about and she turned to a girl she knew in her class. “What is it?” Alice laughed as the 3 girls sprinted across the field towards the growing crowd of kids. “It’s Aliens!” Gabby said in a loud sort of a whisper as if she wanted to shout it out but didn’t want to let the teachers know. “Aliens?” Poppy and Alice exclaimed together. Poppy wasn’t sure whether she should laugh or just go with the game. It was obviously a good game if the whole school was getting involved! Poppy and Alice exchanged amused but baffled expressions as the girls came to the back of the crowd. Gabby being Gabby started ploughing her way through the group of smaller kids who all seemed to be in some kind of trance, eyes wide and mouths open in awe! Straight away Poppy noticed how quiet it was. Something wasn’t right. With all of these kids and a game about aliens it should be noisy not quiet – it was completely still too. She started to get butterflies in her tummy as they pushed their way through what appeared to be the whole of year 3. Suddenly they were through and she stumbled to a stop as Gabby and Alice both gasped and she blinked a few times trying to get a grip of what she was looking at. Gabby had been right – it was aliens! “Oh my…” Poppy started but couldn’t finish. There in the corner of the school field was a flying saucer. A real live, glowing, humming, purple flying saucer and sitting on top of the craft was a little blue alien waving at the kids. Poppy shook her head and rubbed her eyes as another saucer appeared hovering above the trees and seemed to flash its beams at the other craft that was hovering just a few centimetres above the grass. 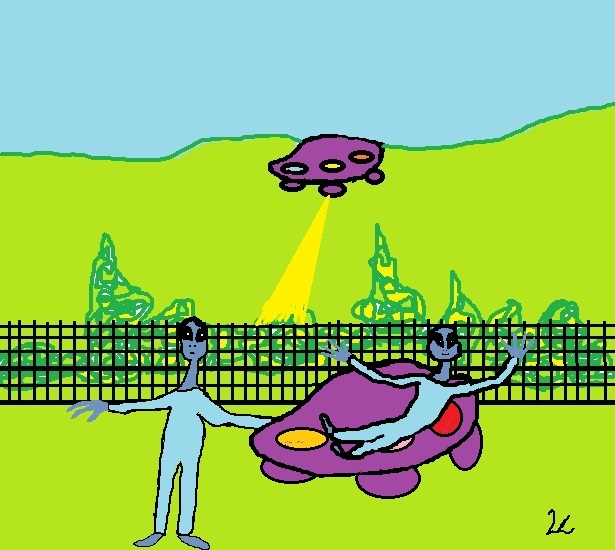 There were 2 more little blue aliens standing on the grass in front of the saucer and the kids had made a great big semi-circle around them as more and more kids had come to see what was going on. Poppy looked around at all the stunned faces and tried to see if any teachers were seeing this, but there didn’t seem to be any teachers out on the playground yet. She looked back at the saucer. She wondered what they wanted and for some reason she felt really brave, so she started walking towards the craft. The 2 aliens that had been standing by the saucer seemed to be startled by her movements towards them and they disappeared in a comical little ‘pop!’ One second they were there, the next they were gone! The group of children all gasped in one moment. Poppy stopped for a second in shock but then she pulled herself together and carried on approaching the space ship. “Poppy! Poppy don’t!” Alice whispered harshly, but she was feeling really brave and rather curious. The alien on top of the ship also appeared to be curious and he seemed to fly down, or rather float, towards the rather adventurous advancing Poppy. There was another gasp from the crowd of kids as Poppy and the alien were soon face to face. “Hello!” She said rather simply to the strange little alien. She could tell somehow that he was amused, although his mouth was so small, just a little slit really, that she couldn’t tell if he was smiling or not. Also his eyes were so strangely bug like, and with no eyebrows, she couldn’t really tell what his expression might be. She just sort of got the impression that he was laughing at her. Then she actually heard the alien talk to her in her mind, not moving his mouth at all. “Aren’t you scared of me?” He asked. “Why? Should I be?” She laughed. The little alien held out his long, spidery, blue arm with 4 very long spindly fingers and she took it and shook it without a second thought. He let go of her hand and ‘pop!’ He was gone! There was another gasp from the kids and the flying saucer lifted gently in the air, flashing lots of different colours and then back to purple – then – ‘zip!’ It shot off into the sky and was gone. Suddenly 2 teachers pushed through the group of kids and all the children turned towards the teachers, still in shock. Prince Bailey, the young son of Radsvinn the Light Lord of the Dragon Realm had spent the past four months aboard a ship bound for a land across the Wide Sea named Nordeland, in pursuit of a pirate known by most as Captain Thief- Heart. So named because people thought he would steal anything even his own heart if he thought he could make some money from it. In actual fact the nickname had grown from the fact that he was searching for a very specific treasure – The Heart of Ice, a fabled diamond that was thought to have the magic to melt even the hardest heart. Jack (As that was the pirate’s real name) was in love with a princess whose heart, he thought, needed softening. She secretly had a crush on the sailor but of course could never marry such a lowly man. He had convinced himself that he would search forever, stealing all the treasure he could lay his hands on until he found the Heart of Ice and could take it to his beloved and finally win her hand. Bailey had crossed paths with the blagard a few months previously and he had stolen the prince’s Dragon Bag which contained not only the Heart of Ice, that he was supposed to be delivering to the Giant King Surt for his father the Lord of the Dragon Realm, but also the magic tools made especially to help him on his quest; a magical map that could transport him anywhere in the realm instantly and a magic key that could open any door anywhere. Luckily the pirate hadn’t discovered what treasures were in the bag as it was the bag itself that had tempted him. As soon as he had seen it he had recognized it for what it truly was, a Dragon Bag, fabled to be made from the skin of the legendary Drako, the King of the dragons of old and lined with the same material found in a wormhole, inter-dimensional matter capable of existing in hundreds of universes at the same time and so able to store anything and everything inside it. (Dragons you see use wormholes regularly and some people even refer to the dragons themselves as great worms because of their long winding bodies.) Can you imagine the amount of stolen treasure a thieving pirate like Captain Thief-Heart could store inside such a bag? The young Prince, just 11 years old but already experienced in the ways of commanding an army had chased the pirate ship from The North Harbour, clear across the Wide Sea and out in the open it was hard to lose sight of the ship but harder to catch up with it. Finally the prince had the scoundrel within his reach and summoning up a storm using a Rune Wand spell he had been given by the Queen of the Dryads, he sat back to wait until the ship and crew were well and truly caught in his spell. From a green velvet drawstring pouch tied to his belt he pulled out a yew stick with the Ogham rune of Luis carved into it. The little stick only slightly bigger than a matchstick glowed and started to grow and change into a wand made from the Rowan and all along its length and on every part of its surface was a spell stamped in Ogham runes. With a clear and confident voice the young prince spoke the spell written on the wand and wove the air with the special movements that would set the spell in its intent. And blind my enemy’s eyes. As the storm clouds manifested it was as if the rune spell carved into the wand whipped it into a frenzy. Bailey controlled the wand as if he were a conductor in a great orchestra, weaving the magic out of thin air with every flick of his wrist and wave of the wand. His hands dancing the magical movements he had been taught. The dark clouds filled with the power of Thor flashed internally as the lightening fuelled storm thundered and glittered around the enemy ship, blocking out all light and any hope of steering the vessel true. The dark clouds for an instant looked for all the world like a great dragon belching out the thick dark mist of dust and moisture. Soon the enemy was blind and dead in the water while the sea and skies all around it were clear, it was as if Bailey had tied a scarf around their eyes and turned them around and around in a game of blind man’s buff and pushed them back out into the ocean until they were dizzy and utterly lost. Pax, the little purple dragon sent along on the trip to aide Bailey in his quest decided they were now close enough to the pirate vessel, called ‘The Jolly Jack Tar’ for him to fly over and try and steal back the dragon bag. He told Bailey of his plan and the boy agreed. “I will never let you down my young master”. He chirruped and off he flew towards the pirate ship. The little dragon weaved in and out of the dark clouds and expertly negotiated a path between the fiery bolts of wand woven lightning. He found himself aboard the Jolly Jack Tar where chaos had ensued and all hands were running about like blind mice in an alley full of Tomcats. Only the Captain was calmly standing on deck giving clear orders to his crew to form a chain and pass down all his treasure to him so that he could store it in the Dragon Bag. The bag was open on the deck and the pirate was shoving chest after chest of his ill-gotten gains into it where they disappeared into some other universe to await safe retrieval at some later date. The purple dragon saw his chance to grab the bag when the Captain turned in a rage to one of his crew because he had dropped one of his precious chests, spilling its contents all over the deck. He scrabbled about trying to pick up every last piece of the dragon stamped gold coins. I worked really hard on this trailer yesterday and I’m really proud of it. I think it gives just the sort of feel I was hoping for. I know I have lots of projects on the go and I should really be trying to get those novels published but unfortunately I’m one of those people who loves writing, and when I’m inspired I will just go for it, like with the novels, but when it comes to the really boring editing side, which means you have to read your own novel about a hundred times during the process LOL I get stuck and have itchy feet to move on to something else. Once the chapel was full, the song priests were joined by Coral and the other apprentice song priests of her rank in the balcony and songs of lamentation were sung, and then after the main ceremony was over and Reef’s teachers and family had given their eulogies and speeches, Pearl was ushered up to the lectern. The whole chapel was quietly observant of this tradition and all of a sudden Pearl was overwhelmed with grief. She tried to calm herself as she knew it was her responsibility as the elected leader of her Chosen group to address her people and speak the required words of her group’s loyalty to Reef. She started to say what was written in front of her and be the strong, calm leader that she was expected to be but the words seemed cold and had no meaning in Pearl’s eyes – they were not sufficient enough to express how they were all feeling. Pearl looked up from the scroll and caught Triston’s eye. For a moment she struggled with the lump in her throat as his eyes held such a deep sadness that Pearl, for a moment, felt overwhelmed. She closed the scroll and looked up at the congregation. She paused and there was a slight ripple of questioning murmurs that ran through the gathering at her unusual behaviour, like a wave upon a beach, rolling to a frothy crescendo. But then the hall grew once again silent as they were all curious to hear what she was going to say, as the first ever human companion to their ceremonial figure head in the Dolphin of Knowledge. She stopped for a moment expecting to be reprimanded for her outburst, any deviation from ceremony was strictly forbidden, but she was surprised to see all listening intently, including the Lord High Priest, so she continued feeling less nervous and slightly more empowered. She paused and took a deep breath. She sighed, “I was jealous of the loving relationship he had with his parents and friends and the freedom of spirit he seemed to have.” There was a sound of shock from the congregation. Love was an emotion not spoken of during traditional ceremonies. Love was a strange emotion that wasn’t easily defined by Atlanteans, being a people not used to sharing intimacy. Duty, honour and commitment to the Temple ways were a socially solemn affair not usually given space for such personal emotions as love and grief. She looked once more to Reef’s parents. His father was supporting his mother who made shy eye contact with Pearl and smiled weakly. She glimpsed her own parents out of the corner of her eye and turned to see that they were both crying. This social display of emotion from them shocked Pearl and she tried to smile at her mother, hoping she hadn’t upset her too much by what she had said. The lump in her throat returned and she couldn’t hold back the tears any longer. She stopped crying and wiped her eyes. “I would like to introduce you to two of Reef’s closest friends, they were as family in the First Temple and I know they have so much to tell you about Reef; I give you -Triston and Angel.” She beckoned for the two to come forward. They explained what Reef had meant to them personally, prompting more crying from the assemblage. Then Pearl returned to the stand and continued with the ceremonial speech that was ‘written’ and must be read by reef’s Chosen group leader. The body was sent off with a multitude of spontaneous song. The Song Priests were positioned as usual, where the acoustics had been studied and maintained to complement their voices and lend their aesthetic waves to direct the bodies down into the deep dark waters. The effect was truly spectacular as the body was lifted as if by magic and levitated up before diving into the water where The dolphin of Knowledge swam off after it to see Reef safely on his way to the after life. 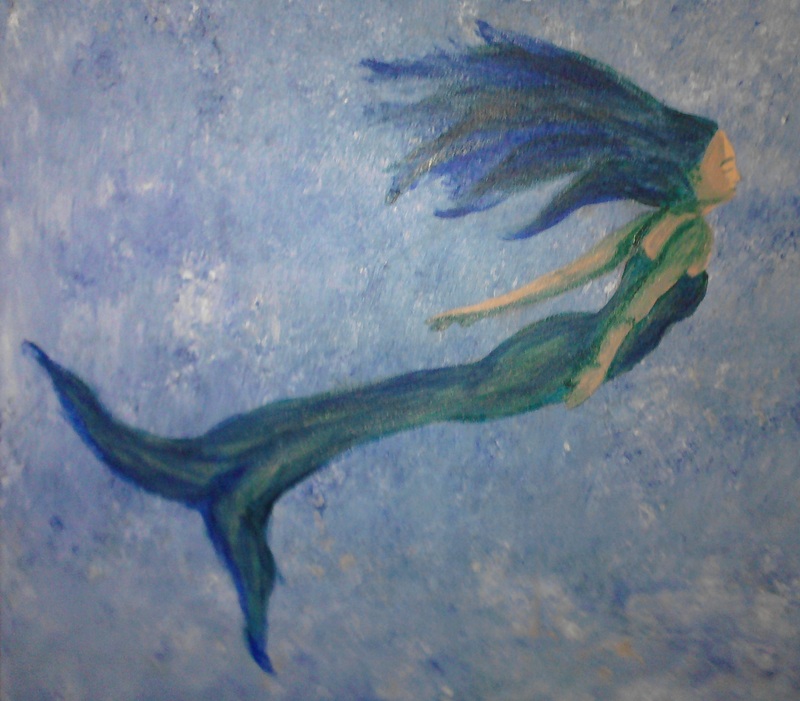 Pearl’s sleep was disrupted by dreams of dolphins and mermaids amidst dark ruined buildings and even darker waters. The silence and the pressure of the water on her lungs were suffocating. 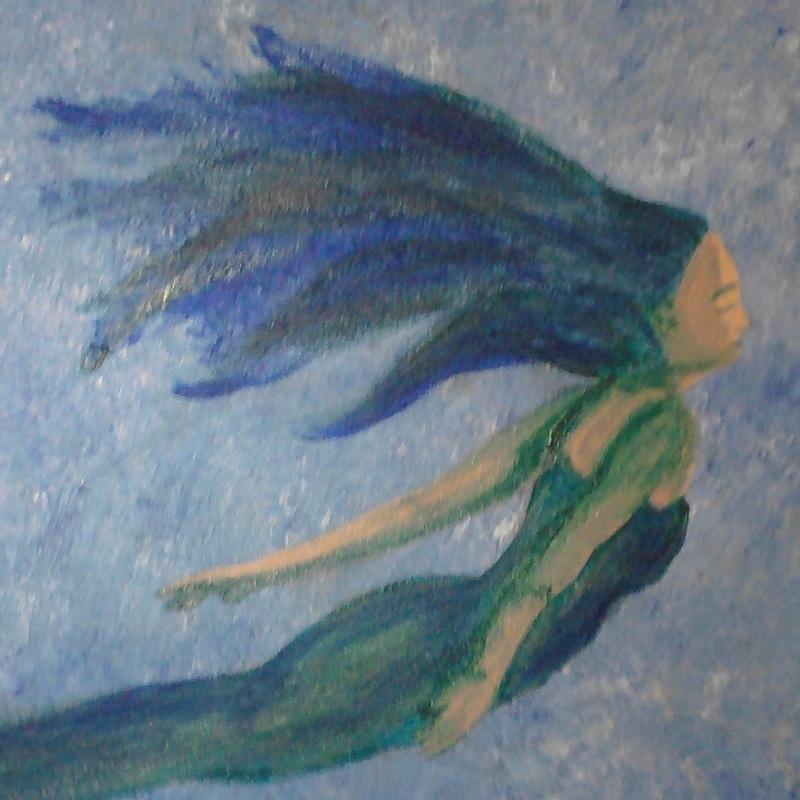 She felt lost and out of her depth and when she focused on the faces of the mermaids, she saw that they were in fact the faces of Coral, Angel and Ariel. Then she saw herself dressed in the robes of the ceremony of the Dolphin of Knowledge. Her creamy white hair floated wide in the ocean, her ringlets mixing with the seaweed that almost resembled a green extension to her own hair and curled about her body like the delicate tendrils of some strange spiritual octopus caressing her tenderly. She reached out her arms to her companions who seemed not to notice her trouble; wordlessly begging them for help as she fell silently down into the murky depths, matched only in its total darkness by the pitch black of unconsciousness she knew would soon engulf her.